Welcome back my friends, to another lame ELP reference…oh, and Confessions of a Comics Shop Junkie, in which I attempt to spotlight several recent works of sequential graphic storytelling that I find noteworthy, and think you might too- many of which may still be purchased for your very own personal enjoyment at a comics shop, bookstore, or online merchant near you if you’re lucky. Or not, as the case may be. I’m what you could call a casual Spider-Man reader; although I read it a lot growing up (the classic Lee/Ditko/Romita years), but when lesser talents took over my interest waned, and now I only sample when someone whose work I like deigns to do a one-shot or multi-issue storyline. The last Spidey series I remember buying on anything even remotely resembling a regular basis was the Spider-Man’s Tangled Web series, which spotlighted above-average creators doing their takes on the Wall-crawler in short arcs. Anyway, one reason why this caught my eye was the byline of Javier Pulido, who’s done a lot of strong work in the last decade both here and at DC, and I wanted to see what he brought to the party here. As it turns out, he brings the booze, the girls and guys, some hot tunes, and has paid off the police for the evening- he’s outstanding. 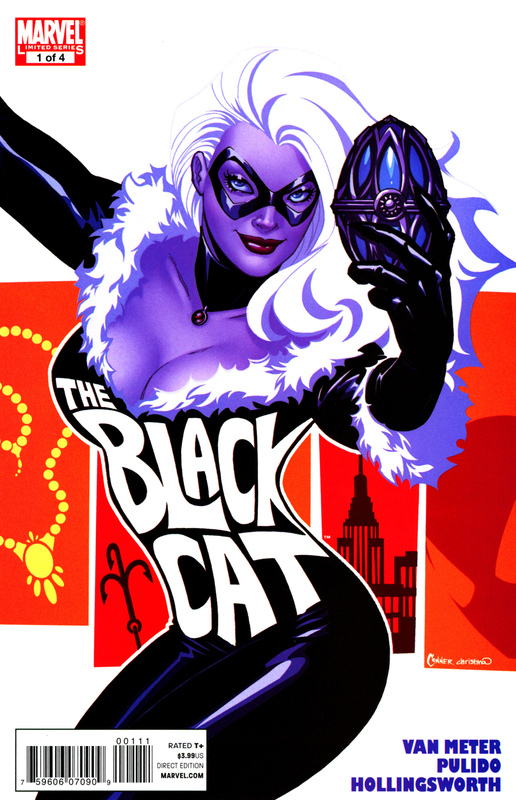 Even though Spidey is top billed, this is really a Black Cat heist caper which sees Felicia Hardy, daughter of Lee/Ditko one-shot badguy The Cat (as in burglar); she follows in the family occupation and also has some sort of bad luck mojo which doesn’t really come into play, at least in this, chapter one. She’s a character I’ve seen here and there, but not very often- she made the biggest impression on me in the not-exactly-canon Spectacular Spider-Man cartoon. Anyway, she’s apparently crossed someone who’s looking to get her; she’s being framed. She’s sleeping with Spidey- apparently in whatever continuity this is they’re an item of sorts, or at least friends with benefits. Russians are involved, which makes me think it will get tied into the big ongoing Spider title-wide continued story that I know very little about called “The Grim Hunt”, which I think has the desired result of reviving the now-dead (I think) Kraven the Hunter character. There’s a prelude to that included in this issue, written by good old Joe Kelly and drawn by the Mike Lark and Steve Gaudiano team, sorely missed on Daredevil- in fact, that’s what the preview looks like. Back to the main feature- Van Meter’s script is OK. I know I’ve read stuff by her before, but I can’t recall where and I’m too lazy to scan the credits online. Dialogue is fine, not terribly snappy but not cliched either, and it bodes well for the rest of the series. Of course, it helps that she has Pulido bringing the script to life; while I’ve seen him do some sketchy stuff in the past, he’s solid as a rock here. If you’re a big Spider-fan or Black Cat fan even, you probably don’t need me to recommend this to you. Those who are on the fence might enjoy it, but it seems designed more for the aforementioned fan, one that has four bucks to blow. Back when I reviewed comics regularly on my blog, I’d do each issue of this all-ages DCU-based series with one word: “cute”. Sometimes, I’d get creative and state “Still cute” or “Even cuter than last time”. But since this isn’t my blog per se, I suppose I should elaborate a bit if I’m going to review this. As you can probably glean from the cover at left, his is an all-ages title, featuring amusingly simple renditions of most of DCs junior hero stable- Robin, Wonder Girl, Kid Flash, a refreshingly two-armed and sober Speedy, Aqualad, and so on. The original Titans are shown as older, later additions to the cast like Kid Devil and Miss Martian are mere toddlers. Their clubhouse is a treehouse. They get into various Nickelodeon/Disney Channel sitcom-esque shenanigans; for example, in this issue Supergirl is expected to babysit all the Toddlers, and her frantic attempts to entertain them, aided by Beast Boy and the male counterpart to Zatanna, Zatara, make up the bulk of the story. Lots of cute jokes and amusing situations, and much of it dependent to a surprising degree on current DC continuity (again, sans Speedy’s disability and other more unsavory goings-on), which makes it all come across as a comic book written for grade schoolers who have studied DC history since they were born, a limited sample set if ever I heard of one. Failing that, it can be said to be for older comics readers who aren’t completely closed off to their sense of whimsy, and that’s the category I fall in, I think. That’s got to be a smaller sample than the other one, but hey- I don’t worry about it, I just read and enjoy. I’d imagine that kids picking these up (or being given them by their parents) will only be confused by its lack of resemblance to the cartoon or by the little girl version of Deathstroke the Terminator (she has a counterpart in the DCU, but I don’t know her name), but hey- I’m no expert. 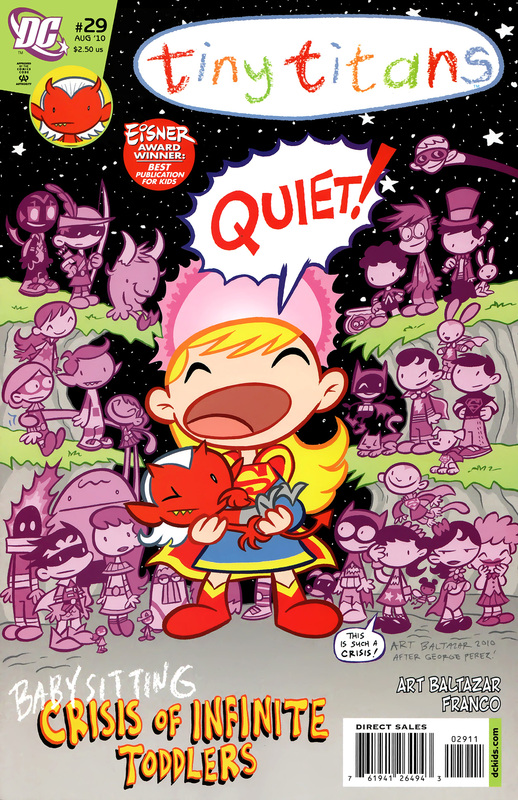 Tiny Titans is a baffling, but very clever, fun, and above all cute comic series. If this sounds appealing to you, I’ll meet you on the playground and we’ll read it together on the monkey bars. I’ll tell you straight up that I never watched a single episode of the 1990’s Disney cartoon series from which this is taken; funny animals, Disney-style even, have always been a hard sell for me, and while I’ve never been averse to watching toons, even at age 31, nothing about the concept (a duck as a Shadow/Batman type) sounded appealing. So why the heck did I sample this, I hear you asking…well, the answer goes all the way back to the dim and distant days of the early-mid Aughts (you know, the previous decade) and the advent of what we all liked to call the Comics Blogosphere, and writer Ian Brill was a big part of that little movement as a charter member of the Associated Comics and Pop Culture Webloggers of Ventura County, CA and Outlying Environs. Anyway, L’il Ian’s all growed up now, and is writing and doing other tasks at the Little Comic Company that Could, and doing it very well as far as I can tell, although I will admit I haven’t read everything he’s written for them. 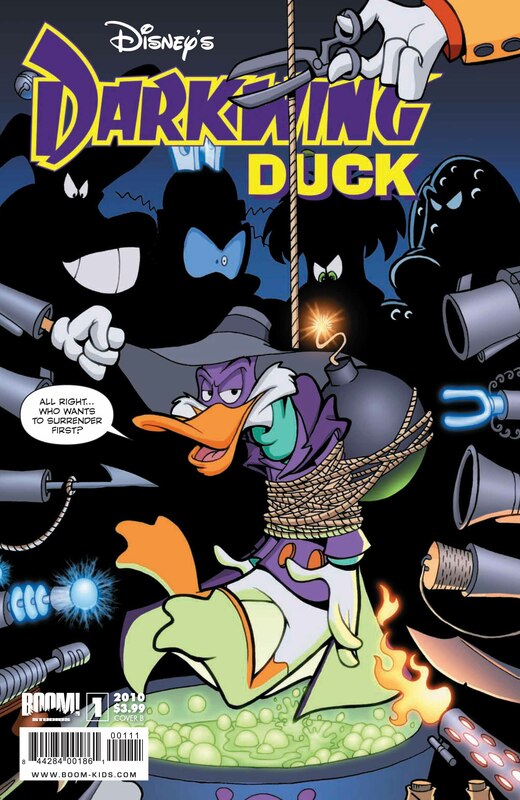 This is the latest thing with his byline, and pretty much served as my introduction to the character- seeming to be Disney’s answer to the Batman animated TV show of the early-mid 90’s, except now he’s more in Kingdom Come territory, “Drake Mallard” is living in the city of St. Canard in semi-forced retirement, working his day job as an office drone for corporation “Quackworks”, and leaving the crimefighting to the oversized police robots that patrol the city. He’s also got the requisite spunky tweenage daughter who wants to get involved, and longs secretly for the old days, even to the point of phoning his erstwhile sidekick Launchpad, but hanging up without saying anything. When a friend of daughter Gosalyn gets arrested for downloading music, it spurs him back into (implied) action, and a good thing too, because it looks like all his old super-villains are reuniting to cause trouble once again. I have no idea how this compares to an episode of the toon series, although I have a feeling it compares favorably; while I think Ian sells the story of Drake Mallard’s discontent a little hard, and this feels a bit padded out, he does get across the dissatisfaction he feels and there are a few chuckles here and there. Silvani acquits himself well; he does a nice job of adapting to the Toon Disney style, and it wouldn’t surprise me at all if he didn’t have a background in animation. If you’re nostalgic for your 90’s childhood, you might find this enjoyable. Music this time out: Tim Moore (1974); Neil Young- Tonight’s The Night; Denny Brooks, Mike Nesmith- …And the Hits Just Keep on Comin’ , The Beatles- The Beatles (The White Album); Beach Boys– Landlocked, 15 Big Ones, the Beach Boys Love You. Hey, it’s Summer. Whaddaya want from me. Foghat- Energized; Tower of Power- Bump City. I was gonna hold forth on the fiasco that is the Jonah Hex film, which I haven’t even seen yet, but that will have to wait for another day. As always, thanks for reading and see you next week.